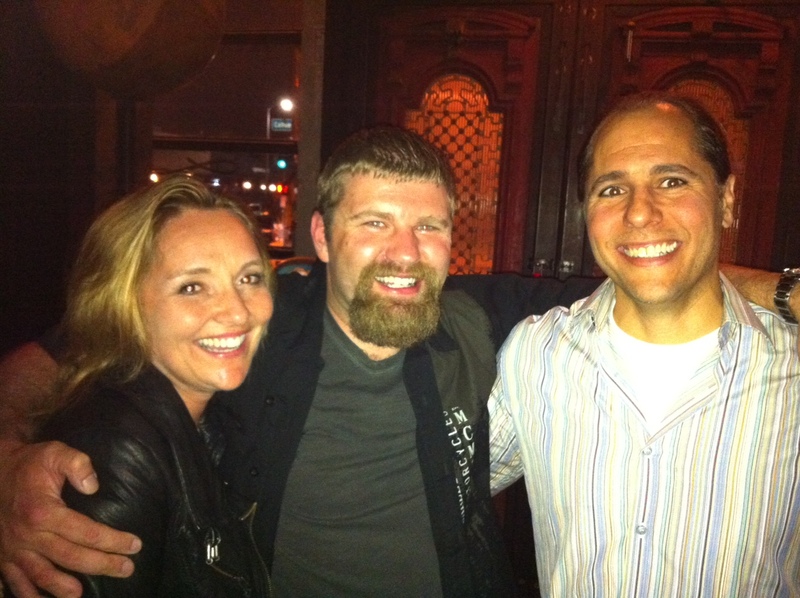 Last night was the premiere of Deadliest Catch season 8, which happened to be the 100th episode and the first show with my hubby’s music – woo hoo!!! We had a lot to celebrate as you can imagine. I mean getting to compose the music for your favorite show is one thing, but then getting to meet all the people on the show and behind the scenes. Don’t forget when he’s not making music he’s fishing hard. Let’s just say it was one of the only times I’ve seen this angler totally geek out and ask to have his picture taken with Captain Junior. Has there ever been a happier composer? So what did we eat at the premiere party? Crab of course! 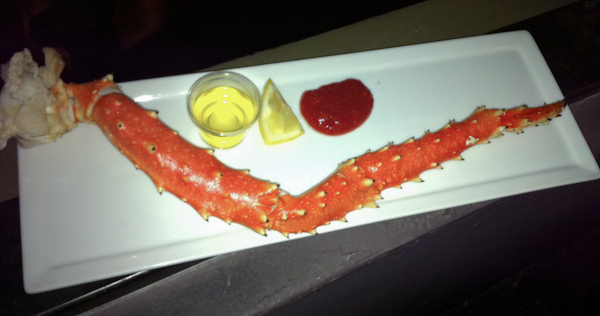 Long orange legs of Alaskan crab served with clarified butter, fresh lemon juice and a spicy cocktail sauce. A simple and satisfying tribute to the show we were all there to celebrate. One of the top producers on the show let slip that he has a freezer full of crab – now that would be a perk. Oh the dishes I would cook up. First off, Curtis Duffy’s Alaskan Crab salad recipe that he gave me for Made in America with the beautiful sugar tuile balancing on top of the glass. Duffy calls his ability to imagine ingredients coming together and knowing what they will taste like a chef’s “mind’s palate.” Nowhere is this gift showcased better than in Duffy’s dish of poached Alaskan King crab. This is the dish that had everyone talking weeks after the James Beard Awards Gala in 2010, when he served a paired down version to 1,200 hungry guests post-awards. It’s a modern interpretation of a classic seafood salad. After shrimp, crab is the most common crustacean on America’s plates; blue or soft-shell crabs, Dungeness crab, and Alaskan king crab are just three of the 4,400 edible species found in America, all cooked up in the many regionally specific dishes. Duffy doesn’t use mayonnaise, called for in the recipes for crab salad of the late 1800s, but instead gets the richness from the flavors and textures of the floral cream, cucumber consommé, and a citrus puree with the crabmeat and crunchy cucumber. A recipe from 1788, originally published in England by Richard Briggs and republished in America in 1792 as The English Art of Cookery, According to the Present Practice, is an excellent example of crabmeat salads of the early colonial period. 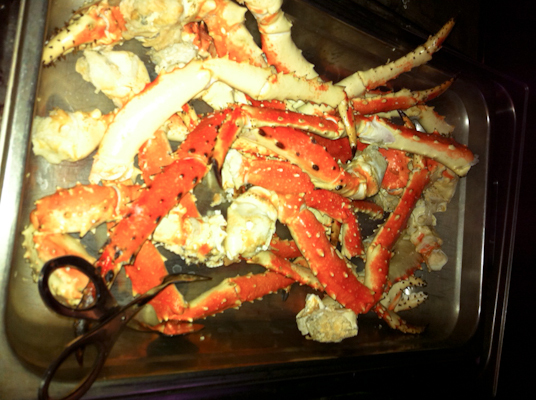 It contains a short recipe on how to dress a crab, using oil and vinegar, a little mustard, pepper, and salt. Skip forward 140 years to a recipe from Alice Bradley for Crab Meat and Tomato Jelly Salad from her book for Luncheon and Supper Guests, 1923, and the crab salad has come a long way from oil and vinegar—Bradley’s recipe includes half-inch cubes of tomato jelly made using tomato juice, vinegar, lemon juice, gelatin, and sugar. The flavor profile to this dish is not dissimilar to Duffy’s salad with the acid and sugar, and the old recipe is also playing with texture using the jelly cubes and the mayonnaise in the same way Duffy is with his accompanying textural components. This recipe takes time and effort to prepare, there are a lot of small components that go in to it, but everything can be done well in advance. 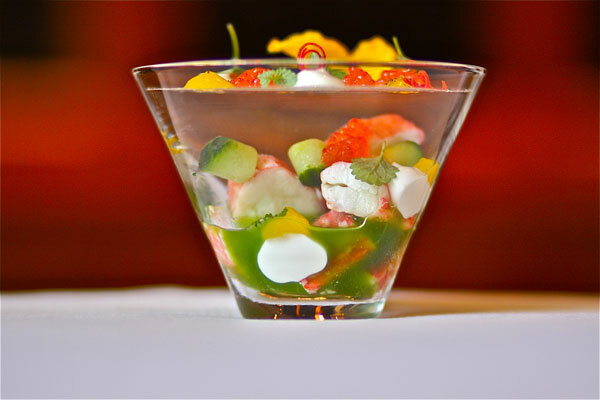 The salad is built at the last minute to produce something that is not only stunning to look at but fun to eat; you have to crack through the sugar tuile to get to the acidity of the sweet succulent crab and cool cucumber consommé. Just as an ice fisherman has to break through the ice to get to the fish below, here you break through a translucent sugar layer, which itself is holding pretty morsels of food, to get to the seafood in the bottom of the glass. 1. Simmer all the citrus fruits together for 20 minutes. 1. In a small pan, heat the fondant, glucose, and isomalt to a hard crack stage (300°F). Pour it out onto a nonstick silicone mat and let cool. 2. Place the hardened sugar into a blender and blend into a powder. Place the powdered sugar into a small chinois and tap out even-layered rounds of sugar onto the mat in the appropriate diameter for the glass serving dishes that are being used. 3. Preheat the oven to 250°F and melt the sugar circles. Cool and remove from the mat. Store in an airtight container. 1. Lightly poach the crab legs in the citrus stock and slice into ½-inch pieces. 2. Pureé one cucumber with the simple syrup and salt to taste in a blender for 1 minute. Let rest for 15 minutes in the refrigerator. Strain through a coffee filter to remove pulp and refrigerate the consommé cucumber juice until cold. 3. Combine the half-and-half, 2 tablespoons of the sugar, salt to taste, house-made floral water, and agar agar in a small pan. Bring to a boil and simmer for 3 minutes. Strain into a bowl and place into another bowl filled with ice. Once the mixture is chilled and firm, place it into a blender and process to a smooth cream. Taste and adjust the seasoning. Set aside. 4. Blend the calamansi fruit until smooth. Sweeten with a bit of sugar until the puree is well balanced. Drizzle in the olive oil and season with salt. 5. In a small pan, combine the rice wine vinegar, 2 cups of the remaining sugar, and the water and bring to a boil. Cook to dissolve the sugar, refrigerate, and reserve. 6. Cut the remaining cucumber into small plugs (mini cylinders), cover with the well-chilled vinegar mixture, and let marinate for 1 hour. 7. Place the crab into a serving glass, layer some of the char roe on top, add the cucumber consommé and 2 of the pickled cucumber plugs. Pipe the floral cream and calamansi puree into the bowl and add a few pieces of tangerine lace. Place the “lid,” or sugar tuile, over the top of the glass and add the remaining roe, a few pools of both purees, and tangerine lace. Add the jalapeño, fleur de sel, and togarashi. Serve immediately, and eat by breaking the sugar tuile into the glass. “Togarashi is not vital to the dish, but it does give the dish a nice touch of spice. For more about Curtis Duffy’s Alaskan Crab check out FujiMama – not just an interview with the chef but a video of her making up the dish and proving how easy – if a little time consuming – this salad is to make. Oh how fun for you guys!!! I saw the producer of this show at Mountain Film last year. What a neat take on bringing about a new season! So fresh and fun. Thanks for sharing! my son, Eli’s, favorite show – EVER!! What a great post! Congrats to your husband and family for his music being featured in the show. I have always been a fan. Boy…those men work HARD. Congrats! I’m so glad you could all celebrate the show’s achievement together. This recipe is so unique. Citrus stock – now there’s something I’ve never made or even heard of. Next time I’m able to get some good crab, this recipe will be on the menu! Oh, big congrats in order for the Leans! That party looks like it was a lot of fun!